So bought a baby bearded dragon from pet co. They didn't tell me how to care for him. Nor did they give me a care sheet. He's only about five inches long. 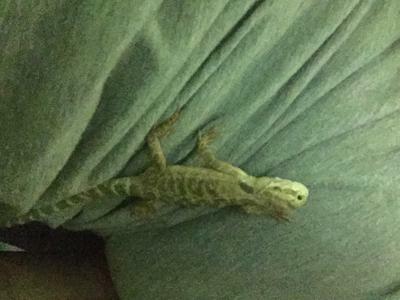 I'v read all kinds of articles online but I want advice from a current or previous owner of a bearded dragon. As of right now I have a towel in the bottom of the cage is that ok if not what should I use? How much should he be eating? He refuses to eat fruit or veggies I've tried strawberry's and bananas he will lick them but not eat them. When I bought him they sold me mealworms I've read some bad things about them online should I switch to crickets? I've read about bathing them should I do this if so how often? I have a 19 or so inch bearded dragon. Yes for now feed the smallest kind of crickets you can get, most pet stores carry small size crickets. Use the guide that food should be no bigger than the space between the eyes. With the large amount of bugs little dragons need it's a good idea to buy in bulk and get a decent size cricket keeper. I use a plastic cage similar to the kind they sell hermit crabs in at the beach. Now This is important. Most people that house crickets have lots of them die from drowning. This is easily remedied. First step is, don't use water in your cricket keeper. Instead I use Fluker's orange cubes, which are packed with nutrients and water for the crickets, and vitamins for the bearded dragon (or leopard gecko, or whatever else) eating the crickets. Or use slices of potato if you don't want to buy the orange cubes. Either way, the crickets will stay hydrated and won't drown. If using potatoes throw in some of the veggies you would normally give the dragon so there is more than just starch in the crickets bellies. Also it's great that you found this site, because once that bearded dragon gets to 2 years old, most things at the pet store will be woefully undersized, use this site as a guide to build better cage furniture. I made a temple out of a styrofoam cooler that has been my bearded dragon's home for just about a year, and the only reason I'm considering making another one is for variety. Basking spots should be close but not too close to the light source, most care guides state about 8 inches from the basking light, but not closer than 6 inches. As far as temperature, remember these guys are desert creatures. Basking spots should be just over 100 degrees (110 is too much! ), but the rest of the cage should be about 85 degrees on the hot side, and 70 degrees on the cool side (all temps Fahrenheit.). It's important they have a place to hide too, it helps reduce stress as they have a safe place to go if they are feeling shy. At nighttime I have a lower wattage blue heat bulb to maintain temp at or above 60 degrees ( I live in upstate NY the house can get cold in the winter) most night time bulbs come in red, but to me it just looks uncomfortable for my dragon at night in red light. During summer I don't bother with a night bulb because it simply won't get cold enough to need one. I would switch to pinhead crickets, and then once he gets bigger -switch to the larger crickets. He needs a lot of pinhead crickets per day, -some feed 50 a day (baby beardies need a lot of protein). I would also provide a hard salad everyday. This includes the greens nobody seems to eat at the grocery store. Turnip greens, collard, mustard, a little kale, and swiss chard. Make sure the greens are chopped up fine so that he won't choke. Once he becomes an adult (after a year) then feed him crickets only 3 times a week, but feed the greens every day. The other thing is he has to have the right lighting and heat. Research this. A good light is the Reptisun 10.0 UVB light, research how far away from the light the dragon should be able to get. You'll also need a heat light and a temp gun or gauge to see how hot the basking area is. For a dragon the basking spot should be around 102F - 110F, the rest of the cage should be in the 80'sF. Since he's young, I would soak him every day -it encourages shedding of his skin.